V Resorts Vrindavan Gopala Bhedaghat provides the best of comforts in a charming ambience. V Resorts Vrindavan Gopala Bhedaghat offers a pleasant stay to its guests. This resort in Jabalpur offers unadulterated views of the Dhuandhar falls. The AC Deluxe Huts in the resort have attached bathrooms and a fireplace setup. 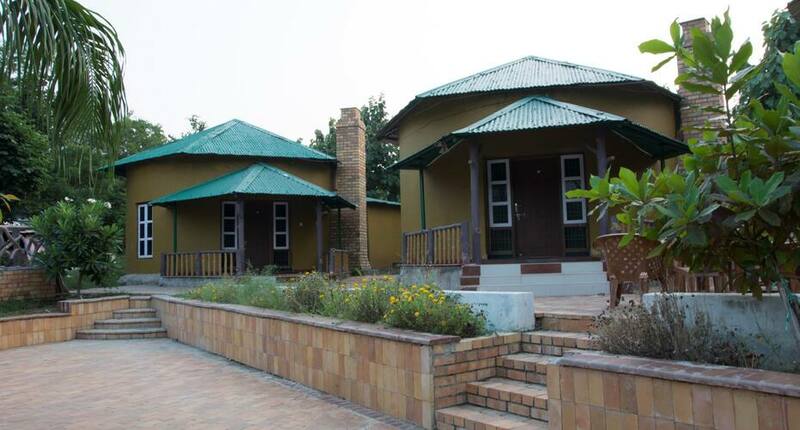 The huts offer modern amenities such as television, geyser, air conditioning, study table and wardrobe. Conference room, green lawns and parking are a few of the facilities available at V Resorts Vrindavan Gopala Bhedaghat. This resort in Jabalpur offers Doctor on call and first aid kit for the convenience of the guests. Guest can dine-in at the outdoor restaurant (with a range of local delicacies) within the premises. V Resorts Vrindavan Gopala Bhedaghat is close to the travel hubs like Jabalpur Airport (38 km) and Jabalpur Railway Station (26 km). Places worth visiting are Narmada Marble Valley (2 km), Sangram Sagar Lake (18 km) and Madan Mahal Fort (21 km). What people love the most about this property is its welcoming ambience and great location. Book now and enjoy world class services at V Resorts Vrindavan Gopala Bhedaghat. Note: Dinner charges are INR 300 per person. Mandatory New Year Eve gala dinner Pay at time of check-in. "V Resorts Vrindavan Gopala Bhedaghat"
The location is just perfect. Right next to the falls. The falls can be best viewed from the restaurant here. We were here only for a nights stay but would highly recommend it to others. The staff is extremely helpful and couteous. They even cleaned our car for free. Simple people going out of their way to make our stay better. Wonderful Resort & unmemorable places in surrounding Bhedaghat Dhunadhaar fall Area. Lovely Resort overlooking the Bhedaghat Dhunadhaar fall. Staff are very friendly and helpful. I had comes with friends,Room was very modern & different to other reports. My one complaint is required a swimming pool. Your Restaurant food was great. Good quality food and good staff/waiters. Overall a nice Resort, and from this experience was very good. Amit DUBAI. There are three things nice about this place , the view , the manager Vinay and the food . The rooms are very badly maintained . Air conditioning and geysers dont work . The worst is the management of V resorts , cheats and frauds . Over charge and over bill . When you object they say please pay when the head office opens they will refund . I am still waiting for the excess payment made . Dont ever ever book with V resorts . very good view of waterfalls. Rooms nearer to dining area are better. Prefer room on front side having better access to all facilities. Rooms closer to the lawn are nice but nine of the rooms have a view of the water fall.